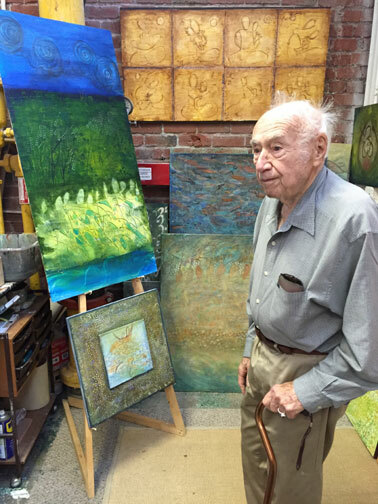 Very happy to share that well known art historian Peter Selz ( former Curator of MOMA New York and also founder of Berkeley Art Museum http://arthistory.berkeley.edu/person/1786359-peter-selz) Visited my studio last month..
Two Paintings on Hollywood Movie Set! By Salma Arastu|2015-03-25T23:18:10+00:00March 25th, 2015|Categories: Current News, Media|Tags: Creed, Hollywood, Rocky, Spiritual|Comments Off on Two Paintings on Hollywood Movie Set! By Salma Arastu|2015-02-14T21:39:02+00:00February 14th, 2015|Categories: Current News|Comments Off on Are We Square Now?